Washington State brought in $7 million in IMCP-aligned federal agency funds just months after receiving one of the “manufacturing community” designations from the U.S. Department of Commerce. That’s a pretty shining endorsement of the Investing in Manufacturing Communities Partnership (IMCP) program, right? But the truth is Washington State began reaping the benefits of the program even before we submitted our application. The value of this program is about even more than funding. Our IMCP application was based on the Washington Aerospace Strategy, already developed by the Governor’s Office of Aerospace and the Washington Aerospace Partnership, so we had a head start. The application process pushed us to dig deeper, to prioritize projects and firm up commitments. We reached out to more stakeholders than we had before, which meant we uncovered great programs and projects and discovered partners we didn’t even know we had. For example, we hadn’t fully explored what our local Manufacturing Extension Partnership (MEP) could do for us. MEP is a National Institute of Standards and Technology program that helps small and medium manufacturers create and retain jobs, increase profits, and save time and money. With a median size of 98 employees, our state’s aerospace suppliers definitely qualify for MEP programs. As a result, two of the six catalytic investments outlined in our IMCP plan are projects developed in partnership with our MEP. We have already secured funds for one of those projects, and the MEP relationship continues to open new doors. Today, the Commerce Department's Economic Development Administration (EDA) announced the next round of competition for designation as a “Manufacturing Community” under the Investing in Manufacturing Communities Partnership (IMCP) initiative. IMCP is designed to revolutionize the way federal agencies leverage economic development funds. It encourages communities to develop comprehensive economic development strategies that will strengthen their competitive edge for attracting global manufacturer and supply chain investments. Through IMCP, the federal government is rewarding best practices – coordinating federal aid to support communities’ strong development plans and synchronizing grant programs across multiple departments and agencies. A compass for navigating the bureaucracy: If you are designated as a manufacturing community, it can be like getting a machete to cut through red tape! While communities don’t receive money for being designated, you will be given elevated consideration from 10 federal agencies for more than $1.3 billion in available grant and program funding. No, you’re not guaranteed to suddenly be awarded every grant you apply for, but you get the opportunity to apply with that designee seal of approval. Moreover, you will have a dedicated federal liaison from one of the participating agencies that can serve as a resource to help you navigate the federal grant application process. IMCP will take your manufacturing strategy to the next level: Manufacturing is experiencing a renaissance. Over the past 5 years, American manufacturing has created nearly 800,000 jobs. The low-paid, gritty, back-breaking labor of the industrial revolution looks nothing like today’s manufacturing. For the first time in more than 10 years, both manufacturing output and employment are growing. Today’s manufacturing workforce are innovative, highly skilled, well paid employees in highly technical industries, with workers earning 17 percent more than similar workers in other sectors. This resurgence is great for the economy as a whole. 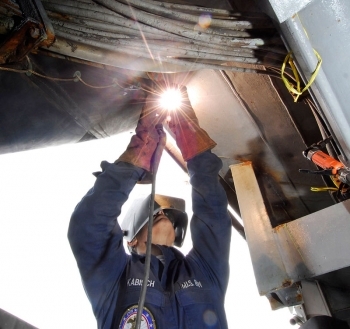 For every $1.00 spent in manufacturing, the sector generates $1.32 for the U.S. economy. Increased cooperation among your region: At the core of the manufacturing community designation is the idea that your region is forming effective partnerships and working across sectors (public, private, academic) on issues relating to workforce development, supply chain, research and innovation, trade and international investment, and access to capital. Making these connections is invaluable for strengthening your local economy, attracting investment, and creating jobs. We witnessed an incredible buzz and enthusiasm among designated communities, applicants, and other participants at our IMCP Summit held last October. It was a showcase of economic collaboration at its best. You’re in good company: The 12 communities designated in the first round of competition are doing some incredible innovative work! From automotive to aerospace, flooring to photonics, these diverse economic development plans are being implemented to boost the economies of regions across the country. 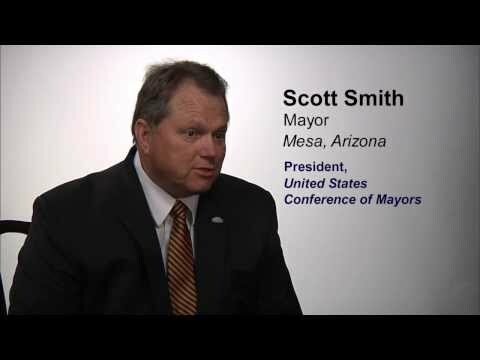 To learn more about each community’s work and vision and the success of the designation, visit: http://www.eda.gov/challenges/imcp/index.htm. You win by just applying: This may be a competition, but there are no “winners” or “losers” here. Everyone who applies benefits from the coordination and planning that is part of the application process. But don’t take our word for it – we heard from several of our first round applicants who were not designated that they found the process of simply applying to be very helpful. They were able to make new connections and access tools and resources to help start meaningful planning for their manufacturing sectors that has helped positioned them for success. These are just a few of the reasons to apply to be a designated manufacturing community. If you’re looking to strengthen your community’s manufacturing sector and regional economy, find your reason and start building your partnerships now. The deadline to apply is April 1, 2015. For more information visit: http://www.gpo.gov/fdsys/pkg/FR-2015-01-29/pdf/2015-01763.pdf. At the Investing in Manufacturing Communities Partnership Summit in Washington, D.C. last week, the Department of Commerce and 11 federal agencies with over $1.3 billion in economic development funding brought together more than 300 people from across the country to share best practices in building local competitiveness and to launch the second round of the Investing in Manufacturing Communities Partnership competition. 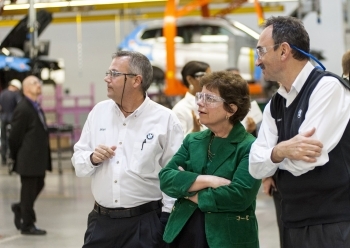 The Obama administration launched the Investing in Manufacturing Communities Partnership initiative in 2013 to build on the momentum in manufacturing we have seen over the last several years. Since February 2010, the manufacturing sector has created over 700,000 jobs and has grown nearly twice as fast as the overall economy. And with weekly hours in manufacturing at their highest since World War II, the sector appears poised for more jobs and growth, helping make the United States more competitive today than it has been in decades. The Investing in Manufacturing Communities Partnership is an initiative that aims to spur communities to develop integrated, long-term economic development strategies that sharpen their competitive edge in attracting global manufacturers and their supply chains to our local communities -- increasing investment and creating jobs. Specifically, the program brings together the resources of multiple federal departments and agencies to support strong local economic development plans. At the first-ever Summit, the 12 communities designated "manufacturing communities" under the first Investing in Manufacturing Communities Partnership national competition shared best practices and an update on the hard work underway in their communities to strengthen manufacturing with other communities looking to grow their own manufacturing sectors. Building on the strength of their local economic development strategies in manufacturing, the 12 communities are attracting new public and private investments in their communities, including over $100 million in new federal economic development investments. For instance, Southern California's designation as a manufacturing community helped Chaffey College secure a $15 million grant from the U.S. Departments of Labor and Education to create an advanced manufacturing training center, which will train workers for the highly technical, highly skilled jobs needed to grow the industry and the economy of the region. The Greater Portland, ME Region, organized by the Puget Sound Regional Council, was awarded a $4.3 million grant from the Department of Defense to transition Washington state's defense-sector advanced manufacturing capabilities over to new applications. When I was growing up, manufacturing work was all about having a strong back and a strong work ethic. These days, manufacturing has changed. The first Friday in October each year marks Manufacturing Day, and today more than 1,500 manufacturers nationwide are opening their doors to host open houses, public tours, career workshops, and other events, in order to show people what manufacturing is – and what it isn’t. There is a lack of understanding of present-day manufacturing environments, which are highly technical. Manufacturing Day provides manufacturers with the opportunity to address the skilled labor shortage they face, connect with future generations, take charge of the public image of manufacturing, and ensure the ongoing prosperity of the whole industry. 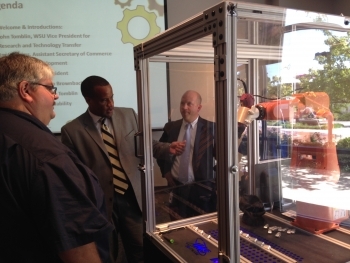 In honor of Manufacturing Day, I was joined by Kansas Governor Sam Brownback and faculty members for an event at Wichita State University (WSU) in South Kansas. The region is a leader in manufacturing, and the University is a key member of the South Kansas Manufacturing Community consortium, which U.S. Secretary of Commerce Penny Pritzker announced as one of the 12 Investing in Manufacturing Communities Partnership (IMCP) designated communities in May. While there, I announced a $1.9 million EDA grant to WSU to support advanced manufacturing. According to the grantee, the project will create 500 jobs and further regional capabilities in advanced manufacturing, with an emphasis on automated additive manufacturing innovation, and will provide competitive advantage for the transportation equipment manufacturing industry. These innovative technologies will also be applied to the emerging medical equipment manufacturing cluster in the region. While in Wichita, I got to see first-hand the sort of operations that have made South Kansas a leader in manufacturing. 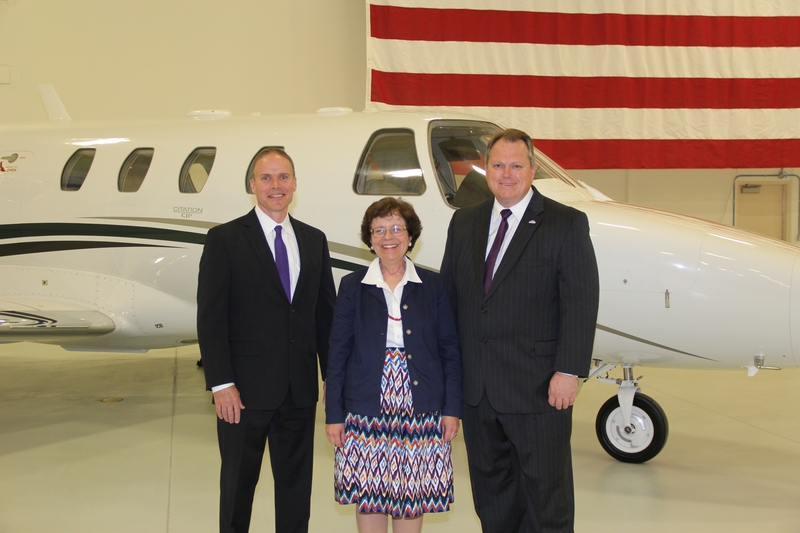 I was treated to a Manufacturing Day tour of the Wichita Operations of Bombardier-Learjet facility, where a critical EDA investment helped expand operations in 2012. The facility is truly impressive – as is the finished product. President Obama, the Commerce Department, and EDA are all committed to supporting manufacturing, because manufacturing creates good jobs with the largest multiplier effect of any part of the economy. In the last fiscal year, EDA invested in 89 manufacturing projects, totaling nearly $78 million. The projects were diverse, representing different industries, different geographies, and different community needs. Half of these projects were construction projects, which created more than 7,000 jobs and generated nearly $4.3 billion in private investment. 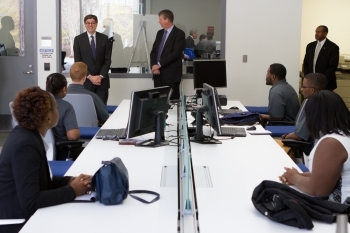 “To build on the progress we have made over the last five years, we have to continue to take action to help strengthen economic growth, create jobs, and restore opportunity for all,” Secretary Lew said in statement about his visit. “CCAM is at the forefront of expanding opportunity by bringing researchers, students, and business together to drive innovation and develop advanced manufacturing technologies. It is also a powerful example of why this Administration’s focus on increasing job training, modernizing our education system, and creating manufacturing institutes is so important." CCAM is changing the game for how we can grow manufacturing in the U.S. Their approach bridges the gap between fundamental research typically performed at universities and product development routinely performed by companies. CCAM’s members guide the research, leveraging talent and resources within CCAM and at Virginia’s top universities, through a collaborative model that enables them to pool R&D efforts to increase efficiencies. Results can then be applied directly to the factory floor, turning ideas into jobs faster and more affordably than ever before. CCAM is just one example of the federal government’s efforts to connect universities to businesses and strengthen American manufacturing and our economy through these partnerships. Secretary Penny Pritzker announced the launch of Phase 2 of the “Investing in Manufacturing Communities Partnership” (IMCP), an administration-wide initiative led by the White House and the U.S. Department of Commerce that will encourage communities to devise comprehensive economic development strategies that strengthen their competitive edge in attracting global manufacturers and their supply chains. Pritzker announced the initiative during her opening remarks at the White House Mayor’s Manufacturing Community Summit. During this phase, communities will have an opportunity to compete for a special designation that will elevate them in consideration for $1.3 billion in federal dollars and assistance from 10 cabinet departments/agencies. These communities could also potentially receive catalytic additional federal investments to further support their economic development strategies. The IMCP is a critical component of the Department of Commerce’s “Open for Business Agenda,” which prioritizes trade and investment. The initiative seeks to enhance the way we leverage federal economic development funds to encourage American communities to focus not only on attracting individual investments one at a time, but transforming themselves into globally-competitive manufacturing hubs. During Phase One, 44 communities were awarded a total of $7 million to support the creation of economic development strategies that recognize the community’s comparative advantages as a place to do business, invest in public goods, and encourage collaboration between multiple entities to expand the area’s commercial appeal to investors. U.S. Deputy Secretary of Commerce Rebecca Blank today announced the launch of the “Investing in Manufacturing Communities Partnership,” an Obama Administration initiative that will help accelerate the resurgence of manufacturing and create jobs in cities across the country. Deputy Secretary Blank unveiled the initiative at the new, 200,000-square foot Able Engineering facility in Mesa, Arizona, a community that has leveraged the resources of the public sector, private firms and educational institutions to achieve a successful model of economic development. Mesa was hard-hit when Williams Air Force Base closed in 1993, leaving many aerospace engineers unemployed. The city took over the site, converted it to the Phoenix-Mesa Gateway Airport, and came up with a plan to attract aerospace companies to the area, where they could capitalize on the existing workforce and benefit from being located near similar firms and nearby colleges. In just fifteen years, Able has grown into a multi-million dollar conglomerate, servicing aircraft from around the world. Its continued growth and support for its workforce demonstrate the benefits of operating within a community like Mesa’s.